Shulman Paper is a paper house conveniently located in the heart of Manhattan that stocks many paper brands popular with pressman and graphic designers alike. With many of the papers we stock, we also offer matching envelopes in various sizes and colors. All converting services that we offer are always done in house and have a relatively quick turn around for your convenience. Featuring our Polar Heidelberg, we offer paper cutting to any size requested by our customers. By using our paper estimator tool, you can quickly and easily determine the final quantity of sheets possible out of a larger parent sheet. Or, you can call to make an appointment with one of our representatives who can help you determine the best layout of your cut, providing the least amount of waste, with grain consideration if applicable. Using our vintage Heidelberg and Kluge platen presses, we offer custom die-cutting of most paper and paperboard projects. Die-cutting involves the severing of paper, board, leather, fiber and other materials into specific shapes using a sharp metal blade, or “die.” This process is excellent for making round coasters and achieving other geometric or custom shapes. Send us an e-mail at imagine@shulmanpaper.com or call us to discuss your die-cutting project. Embossing is the process by which a permanently raised, three-dimensional design is achieved on the surface of a piece of paper using two corresponding dies (one raised and one recessed), between which the paper fibers are pressed by applying a specific amount of pressure. This process – often used in combination with foil stamping – is utilized to create a high quality, tactile contrast between the pressed design and background of the paper. Foil stamping is a printing process by which metallic, matte, shiny, pastel, clear, or holographic foil is adhered to paper using a specific amount of heat and pressure. 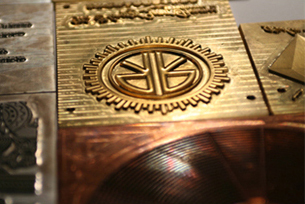 When a piece is stamped, foil adheres to the surface of the paper in the specific design of the metal die being used. As in letterpress printing, the pressure by which foil is applied can be increased or decreased, varying the amount of deboss (or depth of impression) into the paper’s surface. The process of foil stamping can also be used in combination with embossing to create a striking, tactile contrast between the pressed design and background of the paper. At Shulman Paper, we utilize our vintage Heidelberg and Kluge platen presses alongside decades of expertise to complete beautiful foil stamped orders that exceed our customers’ expectations. At Shulman Paper, we offer custom and standard hole punching options with same day service. Whether you would like a small hole punched in gift tags, or multiple ¼” holes to fit a specific binder, we will complete your order on our Nygren Dahly drill press hole puncher with precision and speed. Please provide us with a sample so that we can best match your desired effect. Scoring is a process of pressing a deep indentation along the length of a card to enable a clean and even fold. Letterpress scoring is a process by which sheets are fed through one of our vintage Heidelberg or Kluge platen presses by hand and quickly scored to ensure your job is completed with precision and speed. This method of scoring works very well for most paper types and weights, and is much preferred over rotary scoring for all cover weight stocks. Letterpress scoring is ideal for thicker papers due to the fact that the impression of the metal scoring rule against the sheet of paper is adjustable, whereas it is not in rotary scoring. Paneling is a process by which a slightly raised, or embossed, border is created along the edges of a card using a paneling die on one of our vintage platen presses. The raised border panel that is achieved in this process creates an elegant frame for your message, adding a special touch to your notecards, invitations, and announcements. 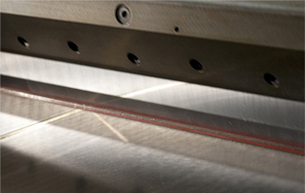 Commonly used for projects involving tabs and tickets, perforating is a process of piercing a line of thin holes into a sheet of paper in order to facilitate separation. At Shulman Paper, we offer perforating of paper jobs, which we run with precision to accommodate our customers’ needs on our vintage Heidelberg and Kluge platen presses. Give your business cards and stationery a special touch by rounding the corners. We offer ¼” and ½” options to best suit your desired effect. With our automatic corner rounder, we deliver that extra sophisticated and charming touch to your project with same day service in most cases. Scoring is a process of pressing a deep indentation along the length of a card to enable a clean and even fold. Rotary scoring is a process by which sheets are fed through the machine by hand and quickly scored to ensure your job is completed with precision and speed. This is a less expensive option than letterpress scoring, and works best for thinner papers, such as 24# or 80# text weight stocks. On our Gibson rotary scoring machine, we are able to achieve crisp scores on paper to facilitate the perfect fold for your cards in no time at all. Mounting is the process by which two sheets of paper or board are evenly adhered permanently, creating a thicker, often two-toned resulting piece. Please call us or send us an email at imagine@shulmanpaper.com to discuss your next mounting project.